Ultra-compact, extremely light weight, high-performance LED headlight features the latest in power LED technology and lithium batteries for a combined performance at the top of the headlight category. The Argo HP® has been specifically engineered to minimize weight and maximize run time. The light’s optimized center of gravity provides maximum wearer comfort and stability during use. 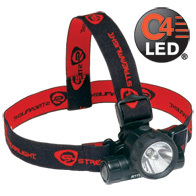 This headlight offers high and low lighting modes and is packaged with an elastic head strap and rubber hard hat strap. High Mode (100%): Up to 6.5 hours of runtime to the 10% output level. Low Mode (25%): Up to 30 hours of runtime to the 10% output level. Up to 1,800 candela (peak beam intensity); 62 lumens measured system output.